When you’ve been birding the Fill as long as I have, it’s hard to find a place you’ve never been. But this year, I have stumbled across just such a place. It’s a tiny field – a patch, really – bordering the south end of the baseball diamond, over at the Conibear mitigation. You can find it by walking across the wooden bridge, south down the service road, past the yellow gate. Here you will find a remnant stand of blackberry along a nasty slough-y area that time and the UW groundskeepers have forgot. The tiny field is at the westernmost end of the slough. You have to come here in the early morning, before the college kids get up. That’s when the birds own this little piece of habitat, and that’s when you can see SPARROWS: Golden-crowned, White-crowned, Lincoln’s, Song, and Fox Sparrows all love this area. So do juncos and finches. A male Anna’s Hummingbird guards his territory here, as does a Bewick’s Wren. Occasionally, shrikes hunt along here, and phoebes. High above on the light standards, Double-crested Cormorants are courting now. They gargle out their mating calls, sounding like woodpeckers knocking on metal. When they open their beaks to nuzzle each other, you can see their lime-green throats. 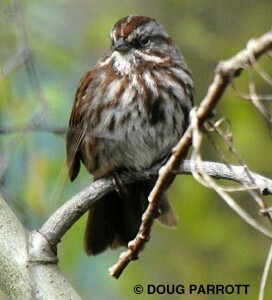 I have become quite fond of the Fox Sparrow who claims this area for his own. Fox Sparrows are large sparrows that look to me a lot like their smaller brethren, the Song Sparrows. One way to tell them apart is by thinking of men’s suits. 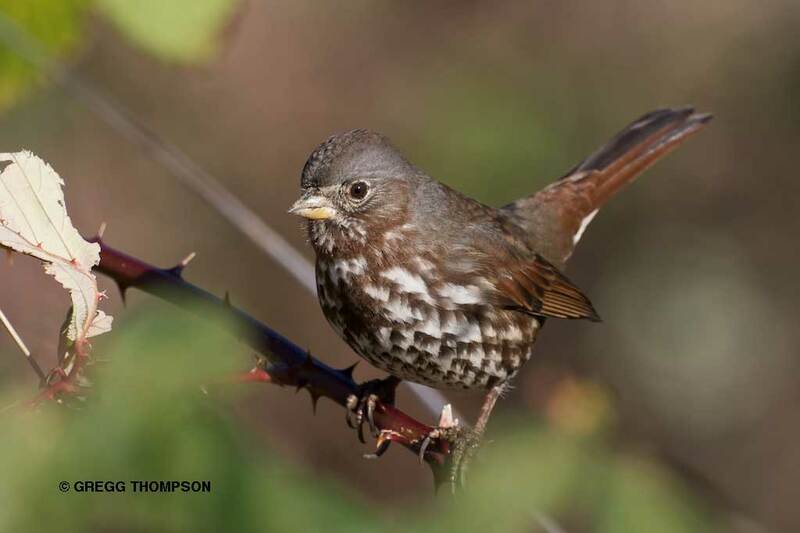 Fox Sparrows wear herringbone vests (v-shaped chevrons down their sides), while Song Sparrows sport twill (blotchy diagonal stripes). Both sparrows forage in this magic little patch, and both will come out to join you, if you’re quiet – and early! This entry was posted in Uncategorized on April 9, 2010 by constancesidles.